Inventive Design is Focused Creativity! What are the Real Needs, Problems or Objectives? ...as opposed to those as first stated! A characteristic of 'Inventive Design' is that the 'Design Specification' is often nebular at first, and only crystallizes-out as the work proceeds! What we mean by 'Approach' is the fundamental attitude, or way the designer has of seeing things. Design often seams to be some sort of compromise between the two poles of 'Form' and 'Function'. 'Form', meaning the style or aesthetics of the design, and getting towards the territory of the 'Industrial Designer'. While 'Function' concerns the practicalities of manufacture, use, service and repair, and more towards the domain of the 'Draftsman'. Still paying great attention to both Form and Function, but 'people' are what the 'design' is all for! For example; Our involvement with Solar Power first started when I was working abroad in the Middle-East, and was about sourcing a free supply of energy to drive irrigation pumps and machinery for the remote village people there. This is fine if the end user is purchasing in £ or $, or for foreign aid charity gifts, but hard currency is extremely expensive for the arid third world farmer: it is still "technocentric" ! The greater the proportion of the system actually designed to be made in the end user's own country, the more affordable the device becomes! The consequence of this is that turnover will rise, bringing its own mass production savings and further purchase price reductions. We envisage that designing for a high proportion of the solar device to be made abroad, will actually increase our business rather than reduce it! 10% of a million units! Once the Design Specification has been established, with its focus, the Design Objective, numerous design ideas or possible options need to be created. It is a fatal flaw to simply carry on and develop the first idea you thought of, it may happen that this was your best idea, but most likely there are neater ways to do the same. We try to get up to 8 realistic design options, less than 3 options is very poor. Rational thought is needed to focus the mind onto the precise problem in question, with all its needs, constraints and implications. However, the designer has then got to switch hats and enter a creative frame of mind, like that of an Artist. I can describe it as being very relaxed while being very awake at the same time. Creative thought though, has no direction to it! the mind just jumps in any direction making its connections. Now the designer must change hats back again and revert to Rational mode of thought, to accept the parts of the creative inspiration that are useful, and re-focus the mind again in the right direction. With many alternations like this, a completely original design scheme or option is moved forward step by step. With practice, the mind can be made to alternate between the Rational and Creative modes of thought faster and faster. On a good day! I can sometimes manage this in about 20 minutes each. It feels most weird, almost like being two completely different people with opposing characters! 'Lateral Thinking' as propounded by Dr Edward de Bono is a favourite method, it can be used for novel detail design through to concept design. Consider all possible arrangements or configurations of one idea, ie. the reverse, the opposite, inside/out, outside/in, etc. Modelling of ideas, either physically or using CAD can assist appreciation of a thought, whereupon a new design can be seen. It is most important to be completely non-judgemental as this impedes creativity, ideas that at first may seem far-fetched must not be dismissed too early, as they can lead to our solution. Sometimes hybrid ideas emerge out of these different design schemes or options, which evolve into very practicable designs. Theoretical Development, outline calculations either by hand or using Microsoft Excel or other special-purpose software. Model Making to try things out in practice; this is where our extensive model making facilities are a boon. The design problem was to manufacture a 'pegged ring', where the pegs have to be smoothly rounded. Several design options were created including; machining from solid, pressed fabrication, welded fabrication, casting and sheet-metal work. 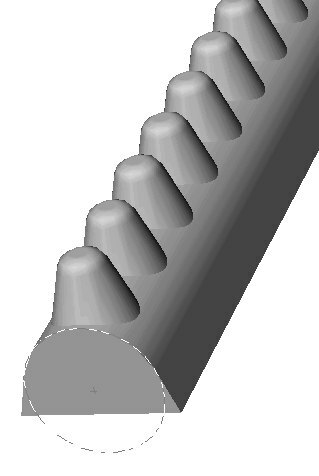 The CAD image shows the chosen very low-cost production method, of first annealing aluminium alloy rod, then passing it under purpose made rollers to squeeze extrude the pegs. The resulting section then wrapped into a ring, welded and heat-treated. This solution is a hybrid of previous ideas on the problem. Now that a number of design options have been created, and each one has had some development work done upon it, the best option needs to be selected for further development into the finished design. Now as each criterion has varying degrees of importance, they must be 'ranked' for the project in question. We normally use a scale of 1 to 10. The Designer now has to assess each design option for each criterion and give a score, again we us 1 to 10. The score is then multiplied by its ranking (or weighting). This is done for all the design options against all the chosen criterion to build up a table, (Microsoft Excel is very useful here). The multiplied assessment values are summed for each design option to reveal the winner. However, in the course of this exercise, hybrid designs can often emerge taking the best features of different design options! When as many design options as possible have been created and explored, fundamental opportunities may well arise requiring a collaborative decision combining great skill and foresight: The existing "designs" could be developed and refined, or something completely new may be given the go-ahead. Here at Jameela Designs.co.uk we mostly use the convenient A3 size printouts, and for security reasons, post them through the Royal Mail. The drawings may also be sent as e-mail attachments, either as CAD files or in PDF format, but security of the finished work is very much a concern. With Patents, you tell the whole world the intricacies of your invention in its (published) description. If somebody has got a patent on their design, then don't let them tell you it is secret, just go along to your local patent library and look it up under their name or its title! The Patent Office doesn't 'police' your intellectual property for you, if somebody copies your idea, then you have got to take him or her to court and sue them yourself. If you have foreign or international patents, you would have to do this in the offending party's own country with translators and all the costs! It only takes a surprisingly small difference to an existing patent, (your patent!) in order to get another patent. Professional Patent Agents are there to help, but expensive, also Patent Insurance is available, but yet another cost. Until you are ready to, and have filed a patent application, KEEP YOUR IDEAS SECRET, only reveal to anyone with a written confidentiality agreement. 'Registered Design' concerns the artistic style of an article that is in production, ie. not for one-offs or prototypes. 'Copyright' on the drawings is potentially a very effective low cost tool, but you must be able to prove the date of the drawings existence, for example by depositing a copy in a bank vault, and having the bank officially date-stamp and seal it. You would still need to insure against the costs of suing any offending party though.